Narrower version of our favourite tyre for road based touring or where durability is required. The Pasela's chevron block tread pattern makes short work of uneven road surfaces. 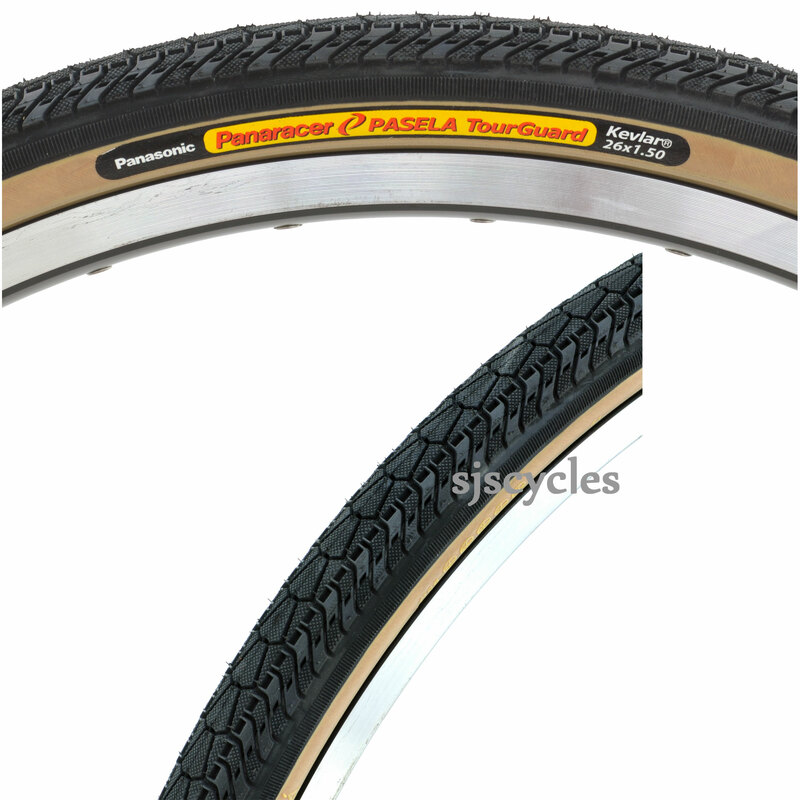 A Kevlar (Aramid) strip beneath the carcass increases puncture resistance whilst Panaracer's durable rubber compound re-assures the rider with plentiful grip in all weather conditions. The only tyre we know that is endorsed for Tandem use! Pasela users will regularly exceed stated max inflation pressures. Good tyre and recommended. I understand however it's to be discontinued. This review will therefore be short lived. I bought a 1.5" version of these tyres for a cyclo camping tour (i.e. carrying quite a lot of weight) and fitted them to my long haul trucker. I just could not trust being able to get schwably marathons on/off my Ryde Grizzy rims (tears, hurt hands etc), even with all the usual techniques - and found, in contrast, that these panaracer tyres were incredibly easy to put on/remove. They are a lot lighter than the marathons and when properly inflated (65lbs) give a fantastic balance of cushioning/absorbing the bumps and stiffness. The walls are thinner than marathons - and i doubt that they are quite as puncture resistant overall. However, I had one puncture in 400 miles - and the tyre was easy to get off and repair. I can't review longevity yet - but in terms of the overall characteristics re puncture resistance, weight, rolling feel, i'm very happy indeed with these tyres, particularly for touring with panniers. hello, I am looking for that tire, maybe you have it? Yes we stock this tyre you're looking for, it is SJSC part number 9398.